I also have been able to stomach more than a few bites at a time the last few days. This is evidenced by my 1lb gain. I’m still not able to drink much at a time and mostly I can’t drink plain water. I have at least 1 cup of iced Morning Wellness tea per day. Powerade is now completely off the menu, in fact, I can hardly even talk about it. 🤢 I still stick to mostly bland and carby foods but lastnight I ate a small salad and it actually went over quite well! I have been eating a lot of sautéed veggies and especially zucchini. Soft veggies with butter seem to go over better than raw stuff. Potatoes and rice and popcorn are safe. Stuff like chili sounds good but doesn’t hit my stomach well. I keep forgetting to mention that I have been a very faithful coffee drinker every morning for quite some time, until this pregnancy. Around 4-5 weeks, coffee became unpalatable. Usually if I skip my morning coffee, I get a massive headache that is only relieved by caffeine. So I anticipated I’d have a bad week of headaches from quitting my morning coffee. But they never came! I guess my body knew it didn’t need/want caffeine right now. I’m pretty thankful for that! I don’t feel as tired this week as I was previously. I notice that I’m waking up earlier and making it through the day without feeling like I need a nap. It’s also nice that I’ve been able to increase my activity level a bit. I really want to get back to exercising but I’m anxious to have another ultrasound first to see if the sch is going away yet. I have no idea when my dr will do one though. They can’t even get me in for my first ob appointment until mid-feb and I doubt that will include an ultrasound. So I’m kind of just flying solo for now. 😂 Every few days when I want some reassurance, I pull out the doppler. I’ve used it far less this pregnancy than any of my previous pregnancies. I think it is mostly thanks to how incredibly busy I am and how fast time flies now that I have so many small people to fill my day with. I wish I was better at taking belly pics this time! I just realized today that it was already time for an update again and I wanted to take a pic for it. But unfortunately our pipes froze last night with the terrible cold we have currently in our state and I can’t take a shower! I look a mess. Anyone who knows me well knows that I take a shower every single day/morning without fail and I absolutely do not go anywhere without my shower. Therefore, no picture today. 🤣 A few days ago my belly was looking absolutely ridiculously huge. I was so very very uncomfortably bloated. Today it has went back to looking about the same as last week. I bought a pair of maternity jeggings and hopefully I’ll be able to find a pair of jeans at the outlet my friend told me about. My jeans are working with the belly band but it just feels gross. I hate that pressure feeling on my belly. My shirts are still fine for now. Mostly I just want warm weather to get here so I can wear maxi dresses!! ❤️❤️❤️ And so I can go outside! Dear God, I’m so very thankful for the nausea not being as intense this week. Please continue to watch over the baby and keep it healthy and safe. Guide us safely though this pregnancy. In Jesus’name, amen. My little peanut of a boy is 14 months already! He’s still just a little guy but he sure is packed jammed-full of personality! He’s goofy and loves to look at us with his eyes wide open while nodding his “yes” very exaggeratedly. He also likes to blink his eyes at me which cracks me up. His absolute favorite thing is music and dancing and I’m shocked to see that he can actually dance with a beat and stay on it really well! He loves to tap his left leg while he dances and running is his new passion. He runs everywhere! Zane doesn’t say any words currently but he finds a way to get his point across. He will go get his cup and throw it in my lap if he needs a drink and he makes an “ee” or “ahhh” sound when he wants to eat. For awhile it seemed like he was saying “Dada” and sometimes “ma” directed towards us, but he doesn’t anymore. If I’m being honest, I’m a little bit worried about his lack of verbal ability. I’m trying to not get to worked up yet since he is so incredibly coordinated with his gross and fine motor skills. I almost feel like he’s putting so much effort into other things that he’s just not working on language right now. 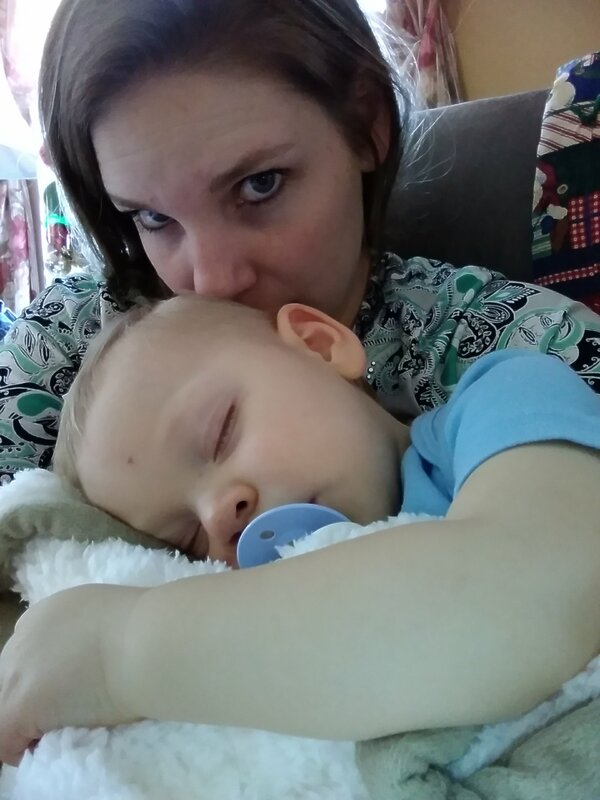 He needs to have his 15 month checkup in a couple more weeks, so I plan to share my concerns with the dr then. In the meantime we have been making a concentrated effort to repeat words to him while showing him items and trying to get him to make the sounds. The other night he was very interested in a hair brush and after repeating “brush” to him over and over while we talked about it, he smiled and said “bru”. It felt like a tiny bit of progress. At least he tried! We’ve made the transition to mostly whole milk in his bottle (and yes, I’m sticking with the bottle for now) and sometimes he drinks toddler formula. I still have a huge stash of frozen breastmilk that he’s using up when we remember to thaw it in time. He’s usually drinking a 5-8oz bottle in the morning, another in the afternoon and usually 1 more 5-6oz bottle in the evening. When Zane decides he wants a bottle it is a dire emergency and he can’t wait .05 seconds! Thank goodness he’s finally as of this month accepting cold milk. Until now he wouldn’t even consider drinking a bottle until it was warm. 😌 As far as eating goes, he’s a pretty good eater and not very picky at all right now. He just doesn’t eat very much at any meal, so he pretty much just wants little tiny snacks all day long. As long as he’s accepting a good variety though, I consider it a win! He’s taking just 1 nap a day around 3pm. Usually he will sleep around 2-2.5 hours. His morning wake ups keep getting later and later though, despite him going to bed around 9:30-10pm every night. It’s not unusual lately for him to sleep until 11-12pm. When he’s not awake by 12, I get really worried and wake him up. I plan to mention this to the dr too. Is it abnormal for a baby who mostly sleeps through the night to sleep so late?? Maybe I should just enjoy it but I find it genuinely concerning. I don’t even like him going that long without eating and drinking. I know he plays hard all day and wears himself out but it still seems excessive. One thing though, he does wake up happy. The other day Tru said “Zane is so so cute. I’m glad God gave us this baby.” It made me so happy. 🙂 Tru has been so dedicated to taking care of Zane ever since he was born. 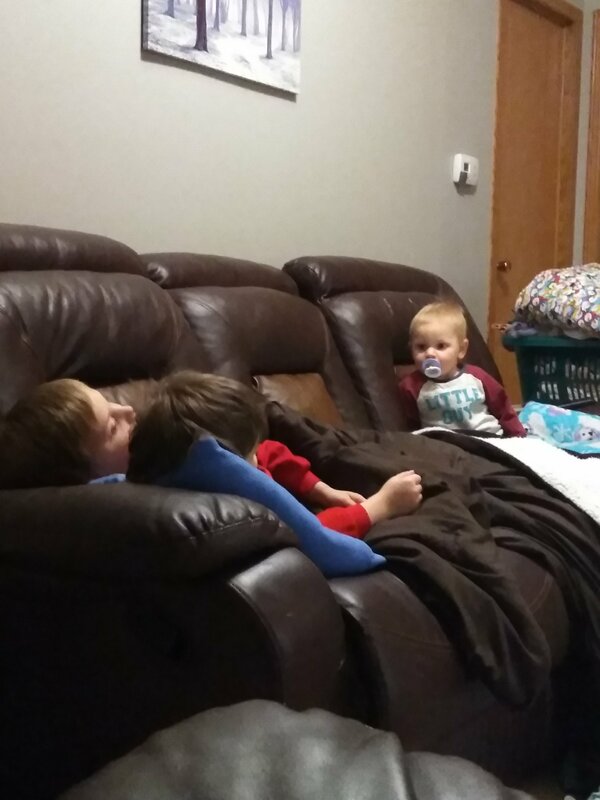 He’s always looking out for him and finding him toys to play with and getting him his sippy cup or pacifier. It’s like Tru just has some special bond with Zane where he feels really nurturing towards him. Zane has been in a phase lately where he wants to wear his shoes a lot. I see him taking his shoes to Tru and Tru just happily puts them on Zane, completely on his own with no direction from us and I just think it’s really sweet. Naturally Levi and Zane get along well most of the time also but I’ve been noticing his special bond with Tru and Zane more and more as time goes on. 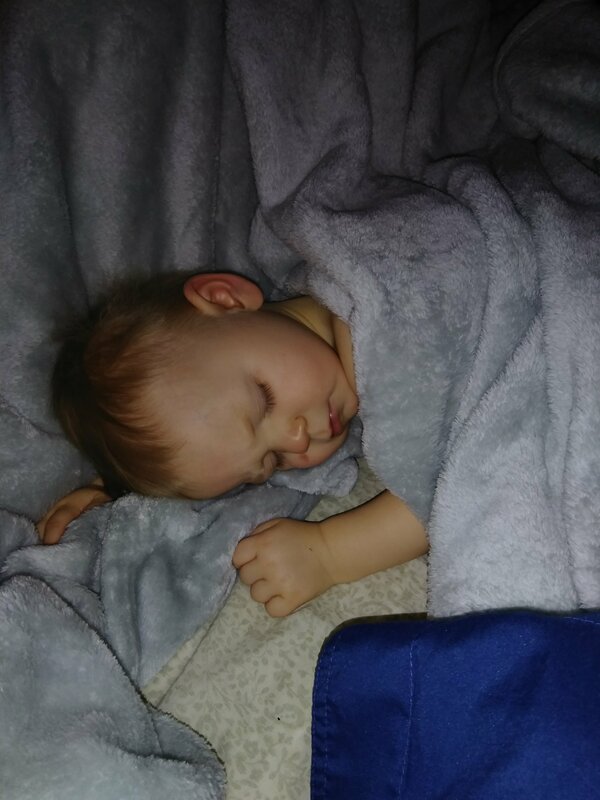 Christmas at Great Grandma’s house wore him out! His hair was so frizzy and i told him i was taking a picture of his hairs. 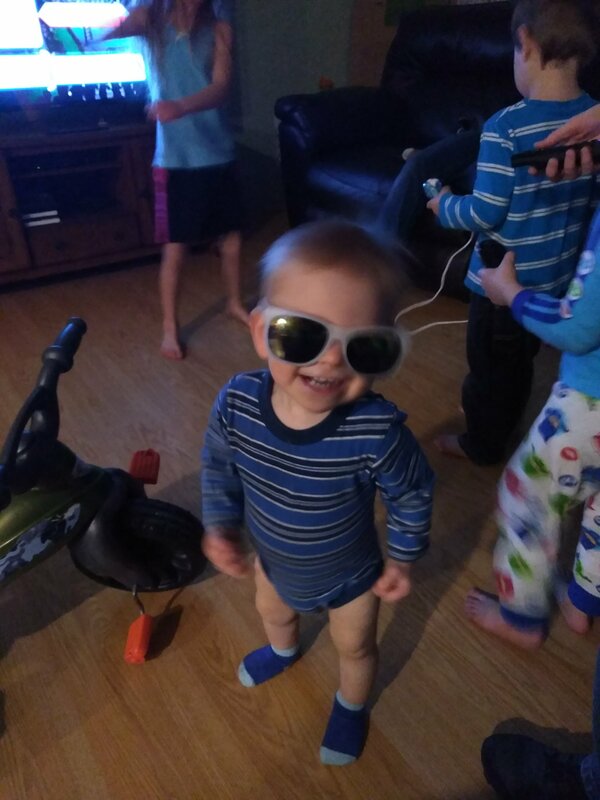 Feeling mighty cool in his sunglasses. Dear God, thank You so much for little Zane. He’s such a bright ray of joy in our lives and he is so loved by all of his family. Please keep him safe and healthy while he grows and learns. In Jesus’ name, amen. We started this week with one more ultrasound before being released to my regular ob. 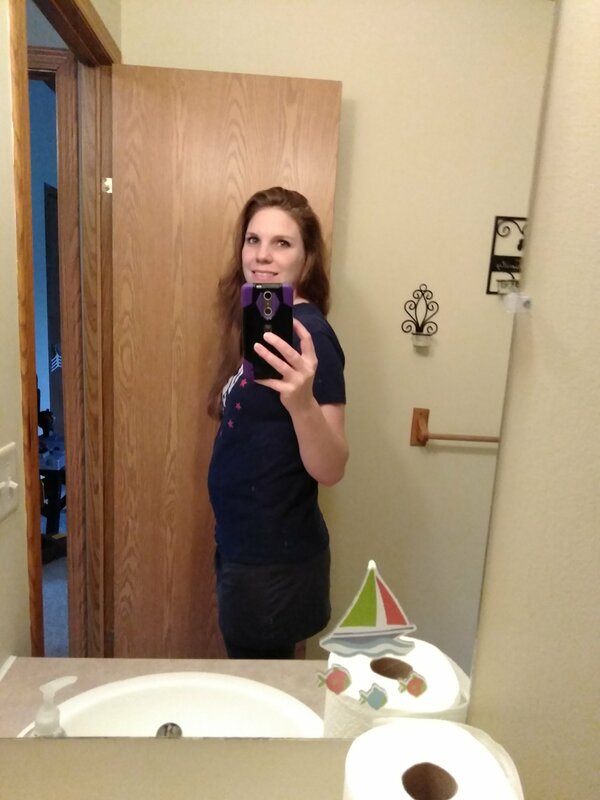 (In case I’ve forgotten to explain this already, I have my RE handle early pregnancy because he will see me much sooner and keep an eye on my HCG and progesterone levels. Once he’s satisfied that the pregnancy looks healthy, he will release me to my ob… His wife. 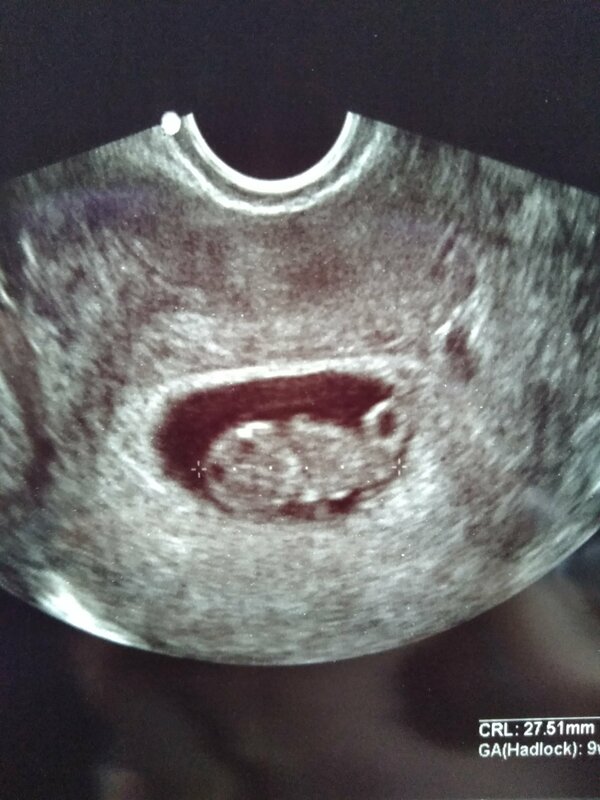 😊) This ultrasound was great because I got to see baby kicking it’s tiny legs and moving it’s little T-Rex arms around. The Dr also pointed out the spine, which is already visible! Baby measured about 1.25″ long. I already love this person so much! This isn’t the best angle though and doesn’t show the legs or the sch. The sch is still there. I think at the first appointment it measured 17×10. It’s now 19×10 BUT, the Dr said he’s not as concerned about it at this point as he was earlier. I’m still just hoping and praying it absorbs and goes away so I don’t have to think about it anymore! He wanted me to remain on pelvic rest but said it’s probably ok for me to lift Zane some. I had one more progesterone level drawn and it came back at 43. With that, he called me and told me to make an appointment with “the lovely Dr K”. 😁 I haven’t scheduled that yet because I have to get my medical records transfered over before they will see me. I plan to continue progesterone shots until 12 weeks, just to be safe because I always take them till around then, but with that high of a level, I could stop sooner. I finally took a belly pic! I feel so bad that I waited till 9 weeks to take one. But until now I’ve just looked like my same poochy self with maybe a little extra bloat. 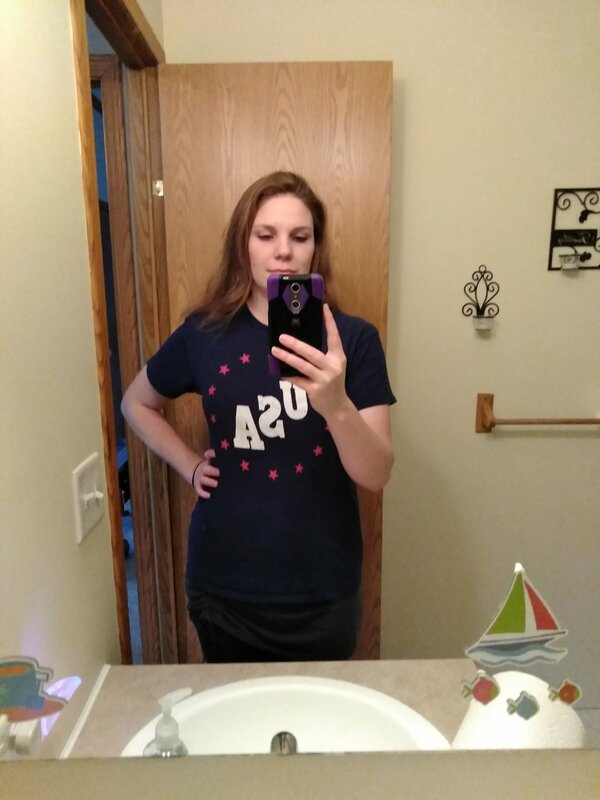 The area where you can actually see my belly rounding out is only visible when I’m not dressed, so to the rest of the world, I just look more bloated than usual. I think it looks like my usual pooch (Thanks kids! Lol! J/k. I love you.) has moved up a little higher. Dear God, thank You for all these blessings. For being 9 weeks already and getting to love this precious new life! Please protect it in Jesus’ name and please help the sch to heal and absorb away. In Jesus’ name, amen. Well, it’s over with. 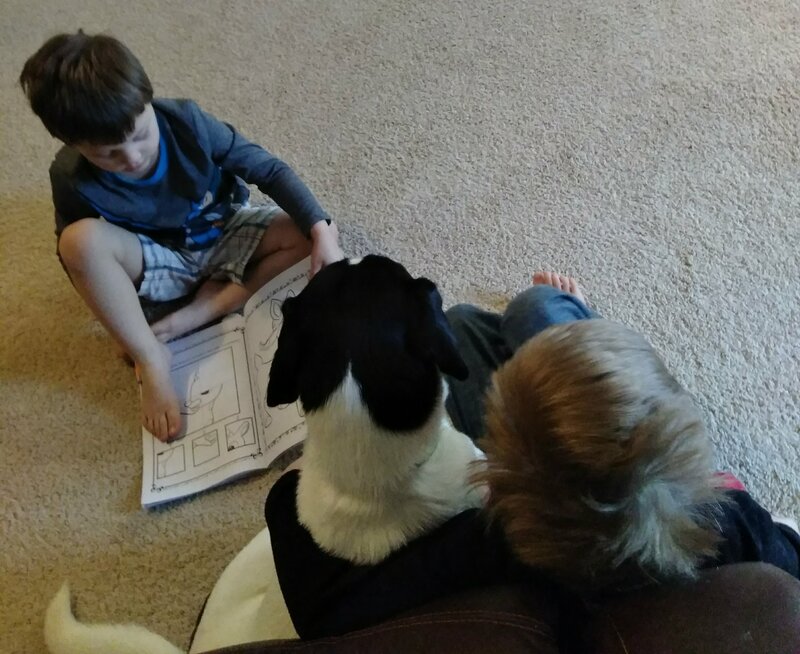 We decided to keep Buddy – the hound mix we found at the shelter. He has been absolutely phenomenal with the kids. He’s house trained (he stopped marking, knock on wood) and calm and is just generally the Mary Poppins of dogs. Practically perfect in every way. 🙂 He sheds a freaking TON though, so I’m looking into whether this is a health issue or what. I’m thinking it’s an abnormal amount of fur (it comes out in clumps), so I need to figure out how to help him get in good health. He’s around 2 years old and I think a little TLC will go a long way. But, back to Rocky…. we took him to the shelter on Thursday. I’m not going to say it was easy; it actually ended up being even more emotional than I had expected. I mean, sure the dog has his problems, but we had him for a year since he was just a puppy! Its a given that we would become attached. I bought him a bunch of his favorite treats before taking him and took his favorite toys so he could keep that familiarity. Once I got to the shelter, I went inside to fill out the necessary paperwork before bringing Rocky in. I was surprised that the woman who had been very accommodating and understanding before ended up giving me quite a bit of flack. She wasn’t being straight up mean, but was definitely speaking her mind. Which, I mean, I do get it. She deals with people all the time who are surrendering their dogs for downright petty reasons. I’d get sick of dealing with those surrenders too! I’m sure it’s hard for her to take anyone seriously at this point. So I went out to get Rocky and he immediately went into crazy mode, understandably. He was pulling at the leash and lunging and acted like he was going to shred one of the small dogs that was there. So the shelter manager lady took him from me to put him in a kennel and he completely tore her arm open with his nails as he was just going so bonkers. He’s a fairly big dog and he can do serious damage when he freaks out! So at this point, the poor woman is applying pressure to her arm with paper towels and it’s just bleeding so much. I waited a few minutes to see if she was ok and if I could do anything and she said to me several times “Honey, this isn’t your fault.” At that point I think she fully understood why exactly Rocky wasn’t safe for my kids (or my visitors!) and why I had to take him there. I don’t know if she ended up needing stitches or if it finally stopped bleeding, but I plan to go in there later this week and bring some dog food and make sure her arm is ok. I’m glad it’s over with but I still really hate how this turned out. The sch actually appears to have moved position and is now below the baby. I guess thats good? The nausea remains the most dominant with it’s ever-present persistence. It’s now a totally unavoidable reality that I have to take 4mg of zofran before I can get out of bed in the morning, or even roll over really. Skipping isn’t an option unless I want to spend my morning hanging over the toilet. I do my Bible study while I wait for the zofran to kick in and then get up and eat something small for breakfast. I nibble all day to keep from getting as sick but sometimes eating just makes it worse and I have to go lay down. Thankfully DH is a pro at taking over the evening routine so I can rest. Food aversions are full force and I struggle to get fluids down. Lean cuisine, breakfast cookies and Powerade are my go-to meals. I try to eat a healthy supper but it’s iffy. Eh, this phase will be over soon enough. I don’t feel as wiped out as I did at first. I took one nap this week but mostly I’ve been fine. I notice that my face is breaking out again a bit. Milk of Magnesia is a staple of my daily routine now. Some days I’m really mega bloated and others my belly is flatter than usual. There is definitely a noticeable expansion in the area right above my pelvic bone. My regular jeans feel really bad when I zip them, so I’m planning to get some that don’t dig in right there. I haven’t gained any weight (thank goodness!) and usually am -1 to 0lbs from pre pregnancy weight. We heard the baby again briefly on the doppler today. I haven’t had luck any other times I’ve tried since the first time and it’s still so faint and I can’t keep the wand on it for more than a few seconds. But Tru and Levi got to hear it this time and they were so excited! We backed out of our contract on the land. We were almost completely through the loan process when we found out from the health department that the existing septic would not be usable for us to build our new house with AND a new septic (provided they could actually fit one in there) would be $10-30,000 depending on soil quality etc. I was torn between whether to just pay for the test and application ($500ish) to see if we could put a new system in or not. But it just didn’t seem like it was going to work with our building plans for where we wanted the house positioned (back from the main road which is fairly busy), so we declined and are back to square one looking for a place. I’m disappointed but trusting that God will provide something even better. We have a dog right now on a trial run from the shelter. We also still have Rocky until we decide whether we are keeping this dog. He’s some kind of beagle mix, we think. Extremely sweet, extremely friendly. Actually very calm. He’s perfect with the kids and they adore him. The only downside is, he has been marking in the house a few times. He’s recently neutered and seems to be only marking where my sil’s intact dog was when we dogsat last weekend. He’s not marking in Rocky’s areas at all. I really don’t know what will happen or if he will continue doing it but Tru will be absolutely devastated if we don’t keep him. It’s hard deciding, especially when I’m so nauseated and a dog is just one more thing I have to take care of. It’s bad timing but I think he might be the right dog. Decisions, decisions! Dear God, thank You for another good ultrasound and for baby being so happy and healthy looking in there. Please help the sch to heal completely and not cause any problems. Please help us with making wise and good decisions. In Jesus’ name, amen. I still haven’t taken a pic yet, which is a shame because there is already more definition at the bottom of my belly. Mostly I’m just bloated and some days the bloat calms down but there’s definitely a rounder look way down by my c section scar. I haven’t gained weight but I think my weight loss is back to 0lbs. 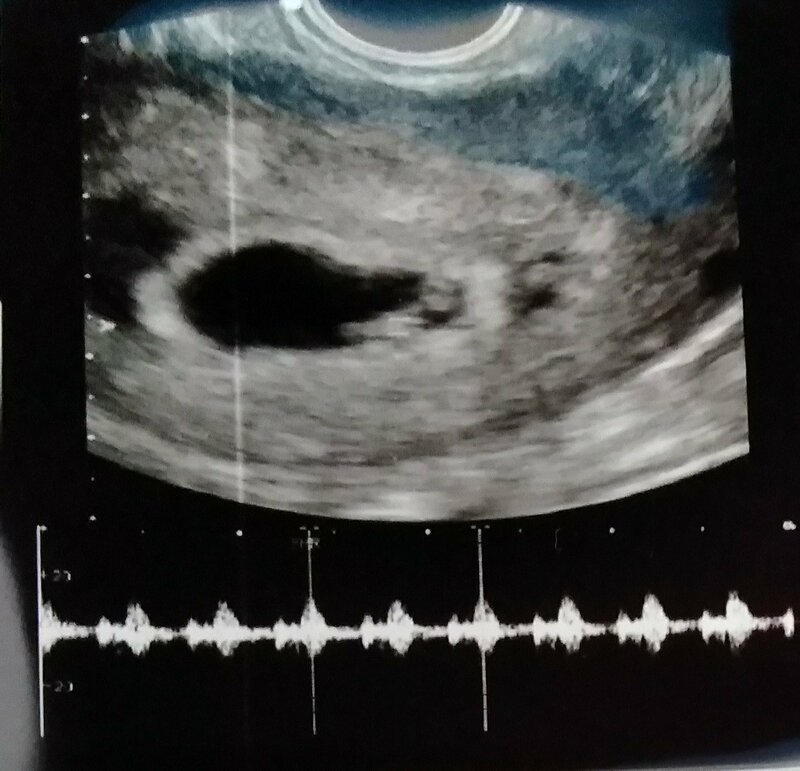 Yesterday I tried my doppler, not thinking I’d actually hear baby until much closer to 9 weeks at least (I’m about 15 pounds heavier this pregnancy than I’ve ever been) but oh my goodness! Ever so faint I could hear the baby’s heartbeat! I couldn’t hardly stay on it because even just inhaling made me lose the very faint sound, but it was there! I felt so happy and like all this nausea is more bearable now. I wish I could post the clip but I’m using the phone app and it won’t let me. So, as I mentioned, the nausea. It’s there 100% of my day and sometimes throughout the night. When I first wake up in the morning, before I even open my eyes, I don’t usually feel the nausea. But then I move a muscle or open my eyes and it sweeps over me. Part of the day it’s just a nagging nauseated feeling and I can still function enough to do the basics but then at certain times it will sweep in really strong and I have to just hold perfectly still so I don’t throw up. It’s not as bad as it was with Zane though, thank God, it’s more like it was with Levi. I’m doing all the natural recommendations and taking lots of different home remedies to get through it, although nothing makes me completely free from the nausea. I’ve taken zofran on my worst days but I’m doing my best to avoid it unless I have to go somewhere or if I can’t take care of the kids because of the sickness. While it is draining to feel sick so constantly, I’m reminding myself it’s just a season. Tiredness continues to be present and I’ve snuck a nap when possible but overall I’m not as exhausted as I’ve been with previous pregnancies (yet!). My main complaint is that I am still always so darn cold!!! I can hardly get warm, so I’m always sitting with a large comforter blanket and wearing a sweater or bathrobe to warm up. That’s about it folks. 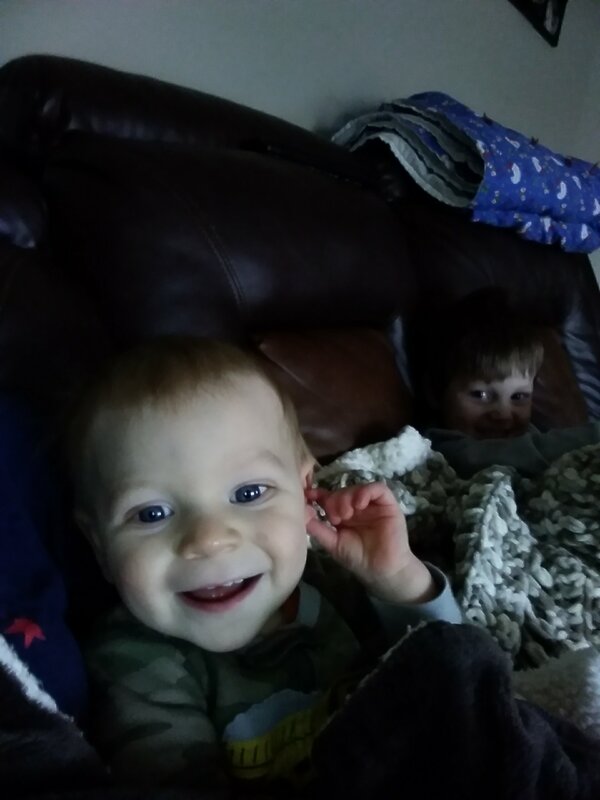 I have been hoping to get around to writing an update for each of the boys. Hopefully soon! Lots of fun stuff going on with each of them. Everyone is getting so grown up! 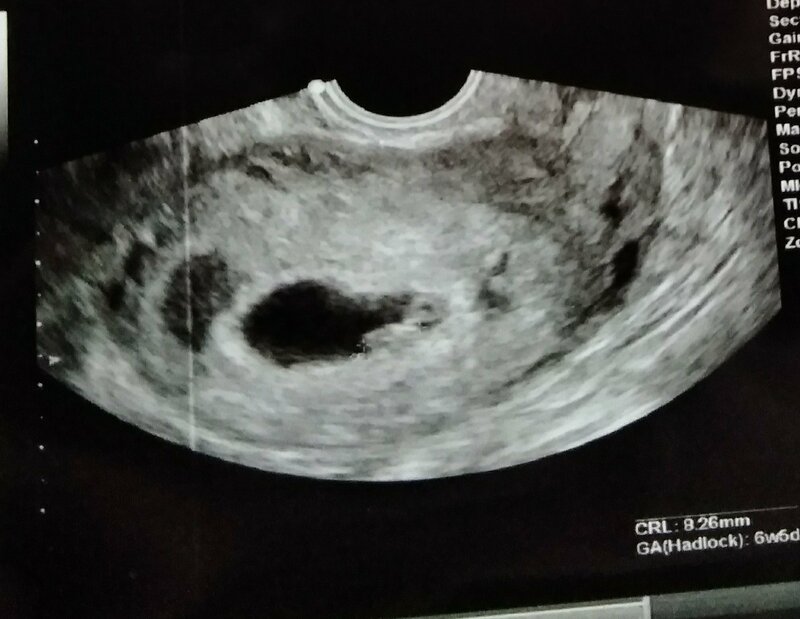 Dear God, thank You so much that we got to hear this tiny baby’s heartbeat! 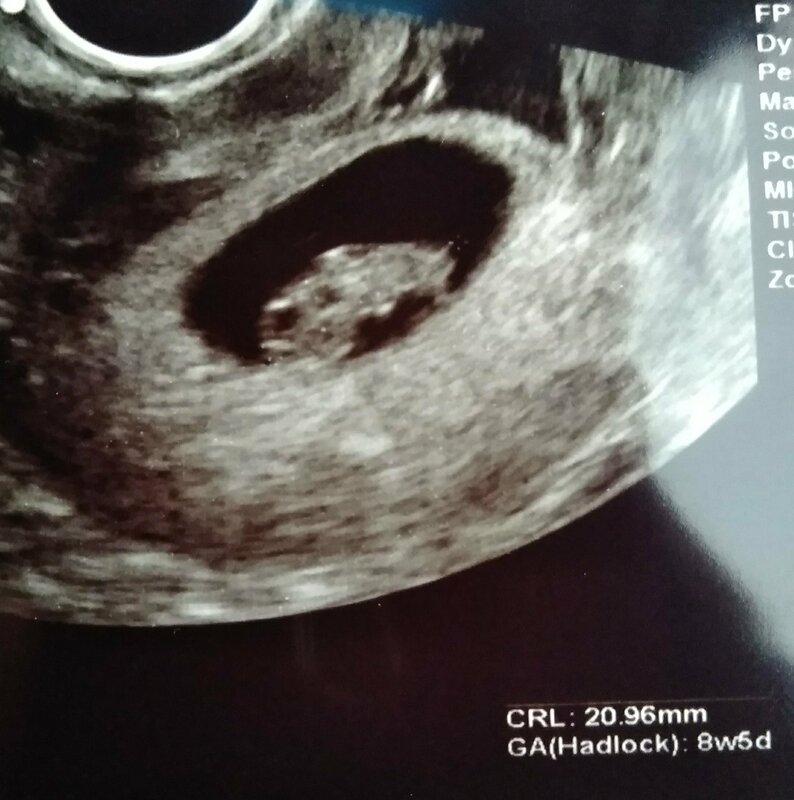 Please help everything to go well with this pregnancy and for the ultrasound to be encouraging. In Jesus’ name, amen. Today we woke up at 6:10am and got ready and woke the boys, then we drove an hour to DH’s cousin’s house to drop of Tru and Levi while we drove another 40 minutes to the Dr.
Zane had a rough night and didn’t sleep much (or let us sleep) so he rode along with us to the appointment. We got there over half an hour early, so we sat in the car for awhile and I tried to get warm. I have been soooo cold lately! It’s like my internal thermostat is completely out of whack. But anyway, the dr ended up running a bit behind, but by and by we finally got called back and the ultrasound started. Dear God, thank You for each day of positive news and success in this pregnancy. Please don’t let anything bring harm to this precious baby. Protect its life according to Your will. In Jesus’ name, amen. I emailed my regular RE today to ask him his opinion on the SCH since the dr yesterday didn’t give us too many details. He said it is hard to say how risky this is, but we should check it again next week and see what it’s doing. He said light activity, pelvic rest and no lifting over 10lbs. I’m glad he gave me more information since this is so much bigger than the one I had with Zane. Hopefully it just goes away!